On Jan. 16, the world’s number-one ranked women’s featherweight Cristiane “Cyborg” Justino defends her title against Daria Ibragimova at Invicta FC 15. Justino had been preparing for a drop down to the bantamweight division. However, Ronda Rousey’s devastating knockout loss to Holly Holm has convinced her to continue her featherweight campaign. Justino has a virtual stranglehold on the division. In her last three fights, she has defeated the second, eighth and seventh ranked fighters at 145 pounds. Against Ibragimova, “Cyborg” has a 71 to 20 advantage in ranking points. That is a 255 percent ranking advantage. Let’s compare that advantage to the other female fighters currently ranked number one. 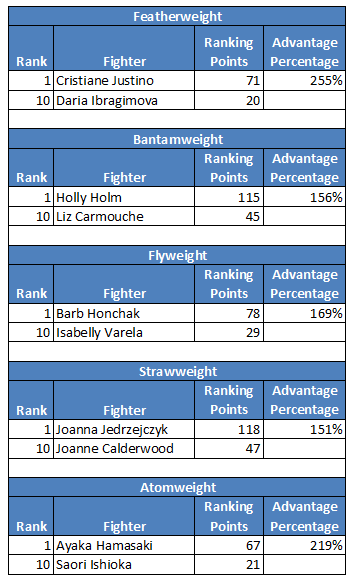 The following table shows a breakdown of how each number-one ranked female fighter stacks up, in terms of ranking points percent advantage, in a hypothetical matchup against the 10th ranked fighter in that division. Clearly Justino has the biggest ranking advantage over her 10th ranked counterpart. It is also interesting to note that the divisions with lowest champion’s advantage percentage are the two divisions sponsored by the UFC. By sponsoring only two divisions, the UFC has motivated top fighters to move up or down in weight. For example, two former Invicta FC atomweight champions, Jessica Penne and Michelle Waterson, both currently compete in the UFC’s strawweight division. Not only is “Cyborg” a dominant champion, but potential opponents are now also motivated by UFC paydays and exposure to move down to the bantamweight division. On top of that, Bellator decided to make women’s featherweight a priority in 2015. They signed several respectable fighters and put on some decent fights. Currently six of the Fight Matrix top 15 had their last fight in Bellator. It is highly unlikely that Scott Coker would lend talent to a promotion that airs on UFC Fight Pass — even with the Vitaly Minakovs of the world running around. Women’s featherweight has always been an odd weight class. On one hand, it is home to two of the most popular female fighters in the history of the sport, Justino and Gina Carano. On the other hand, it seems like most of the sport’s talent populates lower divisions. Elite XC promoter Gary Shaw tried to solve this problem with the addition of the absurd 140-pound division. Carano struggled to make weight and picked up wins over four bantamweights before the promotion closed up shop. Barring the conversion of a high level wrestler or kickboxer, the current landscape of women’s featherweight will remain pretty much the same. If “Cyborg” stays in the division, she will almost certainly remain Invicta champion and the number-one ranked female fighter at 145-pounds.